There's no hope for me now, because I have an ear worm - that's one of those tunes that gets stuck in your mind and plays over and over. This one is particularly bad: it's the opening theme to Rocket Robin Hood, a cartoon I used to watch when I was little. When I looked it up on YouTube, I was astonished to discover that it was a CANADIAN cartoon - produced by Trillium Productions, which should have told me all I need to know (the trillium is Ontario's official flower). This is why the only Americans who know of it are those who grew up along the U.S.-Canada border, and were able to receive Canadian TV signals. Apparently it also was shown in the U.K. - one of the advantages of belonging to the Commonwealth, I suppose!) This cartoon was typically shown on Sundays - Saturdays were for the lavish American cartoons. It's odd, but I can't remember any actual episodes of Rocket Robin Hood; I clearly remember the little "intervals", where characters like Prince John and Friar Tuck were introduced, but the episodes themselves have vanished from my memory completely. This also has a catchy opening tune, though the lyrics sound a little funny today. It's bad enough to have to listen to "Softness in his eyes,/Iron in his thighs," but I had to convince Dean that an earlier line was "With the strength of ten/Ordinary men" not "the length". This must be the worst hockey season for Ottawa since the franchise first started in the early 90s. It's surely the worst since we came back from Boston. The season's only half over, and the Sens are already out of the playoffs! Yesterday's paper had an article by Pat Hickey of the Montreal Gazette, on the many injured players the Montreal Canadiens will have to do without for tonight's game against Ottawa. (I can't find a link to it online, unfortunately.) The headline read "Habs likely down three for game in Ottawa". Dean glanced at the headline and said, "Oh, great! Now the Senators are so bad, they're being given a 3-point handicap going into Friday night's game!" Well, it works in golf, why not hockey? The sad thing is, even if it were true, it wouldn't have saved them from last night's 6-2 defeat in Philadelphia. They stink. Oh, by the way, see those people over there? Yes, the ones who had nothing to do with it. They did it. Let's call it Vanderleun's Law: the principle that every stinking blossom and rotten fruit that comes forth from the tree of Liberal Socialism is to be blamed on Conservatism. Thus, 2 weeks ago, we had the Left's itchy trigger fingers letting fly on the Right within minutes after a dope-addled schizophrenic shot up a Congresswoman 's meet 'n greet in Tucson. The Right and Sarah Palin had been allowed to release toxic emissions - ideas - into the atmosphere, and this invisible but deadly cloud had enveloped one Jared Loughner and caused him to go berserk. To their surprise, this "argument" was not allowed to stand unchallenged, and today the Left has seen its victory crumble before it could be grasped, and must console itself with mere sullen refusal to apologize. They should be thanking us: we stopped them before they could follow their insane reasoning to its logical conclusion and declare that Loughner himself is a "victim". In a nearly 300-page grand jury report filled with ghastly, stomach-turning detail, prosecutors said Pennsylvania regulators ignored complaints of barbaric conditions at Gosnell's clinic, which catered to poor, immigrant and minority women in the city's impoverished West Philadelphia section. Chris Johnson has collected a good number of examples of Vanderleun's Law, as pro-abortion writers immediately try to blame this abomination on the people who were systematically frozen out of all opportunities to get in the way of the Slaughterhouse Doctor's multi-million dollar empire: the Right. The Pennsylvania Department of Health chose sides: the abortionists were on the side of the angels, and could not be permitted to be inconvenienced in any way. Just complaining about conditions was evidence of "anti-abortion" heresy, and so complaints were to be ignored, and the path made smooth and easy for anyone who provided this valuable public service. This is what you get when make Death your god: butchered and broken bodies piled on a blood-soaked altar. Now the doctor's been outed, and for once even pro-abortionists can't keep up the smug act. This is actually a filthy horror, and so their first thoughts are to find a convenient conservative scapegoat to smear the blood on. Coming on the heels of the Tucson Debacle, they're facing an alert and prepared Right - they're not going to be taken by surprise by a sucker punch, and I trust the Right will hang this rotting albatross around the necks that own it. My aunts have been sending me reports about their strange encounters with tomatoes over the past year. Last week they sent me a clipping from a gardening magazine where someone wrote in describing the same experience and furnishing me pictures. Auntie Kay asked me to put this up on the blog, because it's really weird and it's creeping them out. I noticed that the tomato had multiple little "pimple-like" bumps on its surface. Some of the bumps seemed to have a "tail-like" appendage which "travelled" under the skin surface of the tomato. 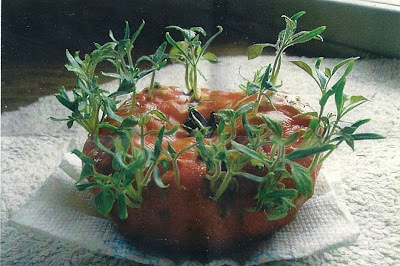 When my aunts finally cut open the tomato, they found that the seeds inside had actually sprouted and the inside of the tomato was a mass of sprouts! It was really disgusting - rather like the creature in "Alien" germinating inside the guy's stomach then bursting out. They tried scooping out the mess inside and just eating the shell of the tomato (which still looked very shiny and appetizing) but Auntie said the tomato didn't taste like a tomato at all: it tasted like HAY. 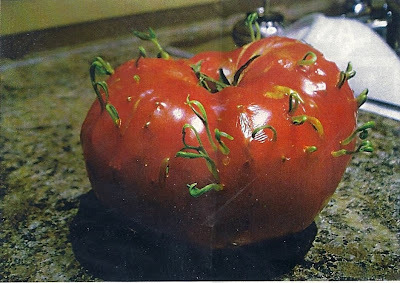 This has happened to a couple of tomatoes they've bought recently, and when they brought the tomatoes back to the grocery store the people there were baffled. These aren't some rare variety, and they must have bought them from regular suppliers, but they're complete mutant tomatoes. I wonder if this might not be a case of genetic engineering, which we've been hearing so much about. The tomatoes do have a characteristic that would make them desirable: they're much less perishable than standard tomatoes. I can see why someone might want to breed for that trait, but this side effect is just bizarre (not to mention the tomatoes LOOK good but taste terrible)! I've found very little online about this. A year ago there were a few posts on gardening boards from people who experienced the same thing, but it seems to be a rather rare occurrence (not for my Aunts, though; it's happened a few times to them). Has anyone else experienced anything like this? 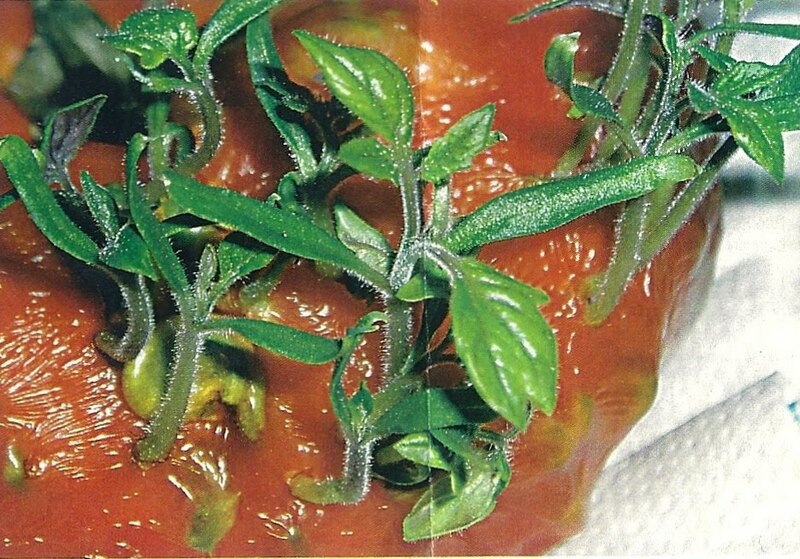 UPDATE: I've tried to find more information on this sprouting tomato phenomenon, and I did find this plus a few other discussions on gardening boards. Opinion is divided on whether it's a question of genetics or chemical additive. Some say it's normal for seeds to germinate inside tomatoes, others say it should be impossible. But I can't help but notice that all of the incidents being discussed are recent - within the past 4 years, it seems. Surely, if this is normal behavior, people should be able to point to older incidents? I mean, think of the decades and decades of tomato-growing history that we can look back on, just in our own lifetimes; why wouldn't there be anecdotal evidence going back a century on this? The best tundering muffins in the whole wide world! Dean's wrestling club is hosting their annual tournament today. It's a big fundraiser for them, and they're expecting kids from all over the province to come, some driving through the night to make it here this morning (and I hope they didn't get caught in any bad snow on the way, because we've had about 5" since yesterday). One of the big moneymakers at this event is the concession stand, and I generally contribute some baking - this year 4 dozen Boiled Raisin Muffins. They are so good, Dean's devious strategy is to charge 25 cents for the first one, then $50 for the next, because nobody can eat just one! 1. Boil raisins in water for 20 minutes. 2. Cream sugar, shortening and egg. 3. Add cooled, drained raisins, plus 1/2 cup raisin water to sugar mixture. 4. Add sifted dry ingredients to first mixture. 5. Add vanilla and stir until blended. 6. Fill muffin cups and bake. UPDATE: They sold them ALL! We did go to see "The King's Speech" after all, at a nice theater out in the suburbs. The theater was about half full, which is a good sign, though Dean did notice that a lot of the audience was older - even older than us! It's the sort of story that I suppose would appeal to older people with a love for and interest in the Royal Family; I was more interested in it as a story of overcoming a handicap. Colin Firth has been a favourite of mine ever since "Pride and Prejudice". He's STILL the definitive Darcy, and I don't even know why filmmakers keep trying to remake that story - I don't think there will ever be a better version than the 1995 miniseries. (A female journalist once wrote, "Like all women, I know exactly what Elizabeth Bennet looks like; she looks just like me!" ) Anyway, I suppose he's done a fair number of movies in the meantime, but I think this must be the best thing he's done since P&P, and now everyone's talking about Oscar nominations and the like. I hope he does win - the sheer voice work on this movie alone is remarkable. As the Duke of York, he has a rather high-pitched, strangulated voice that makes you feel the character's exhaustion every time he tries to choke out a normal line of speech. He also does a good job portraying someone who's ALREADY isolated and cut off from ordinary life - it's not just that as a Prince he doesn't carry money on him (the running theme of the shilling he owes his voice teacher is quite amusing). He knows he doesn't know ordinary people or have any idea how they live, but the speech impediment makes it all but impossible for him to begin to break out of his tiny family-sized zone of safety. As Logue says to him at one point "What are friends for?" "I wouldn't know," answers Bertie bleakly. There's one part that I really liked - the movie managed to take a cliched moment and make it surprising. When during their first meeting Logue 'tricks' the Prince into speaking fluently - he reads Hamlet's soliloquy while wearing earphones playing Beethoven, so he can't hear his own voice - Logue records the speech on a record and gives it to Bertie to take home as a souvenir. Months later, Bertie is listening to a jazz record at home and gets up, irritated, to change the record. I expected it to be that old chestnut: He's forgotten all about the record, and picks it off the pile and puts it on, expecting to hear music, and instead is astounded to hear his own voice speaking fluently! But no - the record plays, the speech fills the room, and we see Bertie sitting on the couch, listening intently. Then his wife comes into the room, and we see the look of astonishment on HER face. She didn't know all this time, but he did. He's listened to that record over and over, and it's familiar to him. It just takes him this long to get up the courage to go back to the teacher to try again. Geoffrey Rush is excellent as Lionel Logue, the Prince's speech therapist, though I found his resemblance to Michael Hordern rather distracting. Bertie has a terrible moment when he discovers that Logue isn't a doctor after all (not that he ever claimed or pretended to be), but is rather an unsuccessful actor. I remembered later that George V at one point tells Bertie that the Royal Family have fallen to the level of the dregs of society, actors, which would explain why he feels so humiliated and crushed to find that his admired teacher is a member of this vile brood. Actually, it makes perfect sense that an actor would be very capable of teaching speech. Claude Rains started life with an atrocious stutter, as well as an almost indecipherable Cockney accent. When working as a gopher at a theatre, an actor took an interest in him and gave him books and techniques to teach him how to overcome his speech defects, which he did through incessant practice. He was really self-taught. Then he went to the trenches in WWI and was injured and gassed; he lost the sight in one eye, and what was worse, the gas paralysed his vocal cords and he couldn't speak! It must have been an incredible blow, but Rains relearned how to speak again - in fact, the gas damage was responsible for that very characteristic slight roughness in his voice ever after. I've hardly any complaints about this movie, except that the actor playing Churchill didn't LOOK much like him. But he had the voice, and that's what really matters. Edward VIII certainly was a caddish loser, and they portrayed Mrs. Simpson as a real torn-down piece from Baltimore. Not that she was ever beautiful, but it sure was hard to see why David was so fascinated by her (must have been those 'techniques' she picked up in Shanghai after all) - they portrayed her as a brassy, pushy American cocktail-swiller. Probably pretty accurate. The Royal Family comes across as quite dysfunctional - bullying males and frigid females, with Bertie trying very hard to create a different kind of atmosphere in his own home. It's always interesting to compare what people thought was important in those days with what prevails today. The typical reaction to Edward VIII Abdication Crisis seems to be "Oh, what a lot of fuss about nothing! Look, today the Prince of Wales can marry a divorcee and see? The sky doesn't fall. Nobody cares any more." I find it all a bit sad. I think of all the sacrifice people went through in the 30s, and don't think they're foolish - I feel embarrassed that their grandchildren just gave up the fight so completely and so quickly. I mean, we're not talking about the days of Henry VIII here, this is just 2 generations ago, and now who takes seriously the idea of sacrificing anything because of duty to God or to the people? Nobody. The present Queen will be the last who does. Christmas holidays almost over, and it's been quite nice the past two weeks. James was so insistent for holidays to start and Christmas to come, but now he's a little bored, and is already asking to go back to school. I won't argue with him - it'll be nice to have a quiet house again, and access to the computer from time to time. My holidays tend to start when the kids' end. Dean gave me a delightful present this year: a LAMINATOR! Now I can not only laminate James's favourite pictures so they don't get lost or torn, but I can also plastic-coat my favourite recipes so they don't get stained and ragged. As usual, I had to cut the picture of the machine out of the paper a week before Christmas and give it to Dean; he never can do the "surprise" thing, and if I don't think of something myself in advance, he'll be asking me, "Uhhh, what would you like for Christmas?" on December 22. Once the kids go back to school I'll get busy laminating some of my favourite recipe cards; I've already tested the machine with my recipe for Texas Brownies and a new one I tried over the holidays: Pumpkin Cheesecake. A few weeks ago I was in the drugstore waiting for a prescription to be filled, and wandered over to the newsstand where I spotted an entire magazine of cheesecake recipes. I shouldn't have, but they looked so good I bought the magazine, and since then I've been itching to try out some of the recipes. The pumpkin one was a great success, but I tried another one for peanut-butter cheesecake and it was too sweet. There's this rhubarb one I'll try in the spring, but now Dean is asking me to just make the plain old cheesecake I used to to make. I tried yesterday, but discovered I needed a lemon, and went out on a quest for one single lemon. Of course, being New Year's Day, my endeavours were fruitless (har har) so I think I might do it today. Thomas and James have gone out for a day of respite with one of their teachers, and so Dean, Emma and I are planning to go see a movie - "The King's Speech", which I've read good things about. It must be having a very limited release in Canada, however, because I think it opened here just before Christmas and it's only at 3 theatres in town.